I didn’t forget about grilled cheese month, I just like to procrastinate. I just like to build suspense. I just didn’t schedule the post. 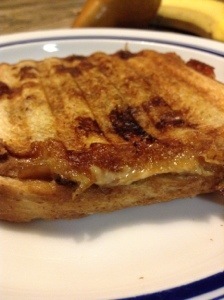 So, without further adieu, grilled cheese rocks! When my best friend was in college, I would drive down to visit her for the weekend, and we almost always ended up at a local restaurant chowing on grilled cheeses with chicken. Such a simple idea, but being new to cooking, so groundbreaking. Don’t forget the ultimate indulgent sandwich monte cristo, which some would categorize as a deep fried fancy grilled cheese. You have your croque monsieur, quesadilla, and panini…call them what you want, they all equal grilled cheese, grilled cheese, grilled cheese. This sandwich is a beefed up version of that original concept. 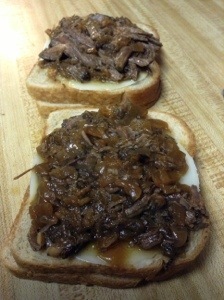 A panini like grilled cheese made with country bread, provolone, caramelized onions, then topped with beef slow cooked until it falls apart. Seasoned the roast heavily with salt and pepper. Heat 2 tablespoons olive oil over medium-high heat and sear on all sides. remove to a plate. In the same pan, add a bit more olive oil and sauté the onion until golden. Add garlic, and sauté for a minute longer. Add wine and broth, increase heat, and deglaze the pan. Pour the onion mixture into the bottom of your slow cooker. Add the seared meat and any juices on the plate, bay leaf, Worcestershire, and thyme. Cover with a lid and cook on low for 8 to 9 hours hours, turning meat every few hours until the meat easily shreds using a fork. Remove the meat to a large bowl, shred, and tent with foil to keep warm. Set aside. Spoon off excess fat from the top of the remaining au jus and discard the fat along with the bay leaf. Strain au jus into a small saucepan and boil until reduced. Mix into shredded beef. Which grilled cheese is your favorite?